Portuguese virtuoso sculptor Carlos Barreira was born in the northern town of Chaves in 1945, but spent part of his childhood in Africa. A determining factor in his future career, there he was in close contact with his uncle Augusto, who helped him understand, study and build toy mechanisms. Years later, he attended Soares dos Reis Art School, followed by the Porto Academy of Fine Arts, where he studied sculpture. In addition to his practice as sculptor and teacher (now retired), he is also a designer and maquette artist, and has worked as a stage and costume designer (Teatro Experimental do Porto). 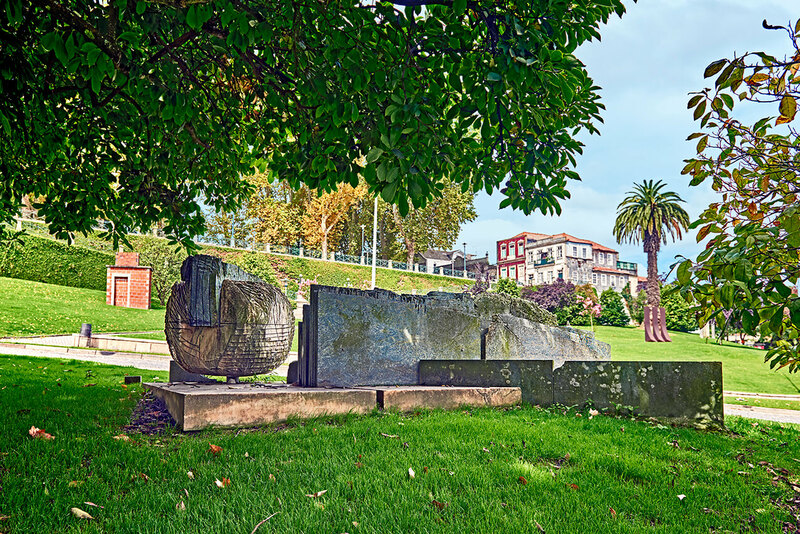 An inescapable figure in contemporary Portuguese sculpture, Carlos Barreira contributed to the 2nd Santo Tirso International Symposium of Contemporary Sculpture with Pedra Bulideira Nº XXII [rocking stone no. XXII]. The rocking stones make up Barreira’s most productive series: twenty-four stones, numbered II to XXV, produced from 1985 (no. II, made for a garden in S. João da Madeira, today practically dismantled) to 2006 (no. XXV, in Vinhais, northern Portugal). Spanning almost two decades, this project was based on a huge boulder (stone no. I), found on the granitic massif of Serra do Brunheiro, near Chaves, where Barreira spent the first years of his life before leaving for Mozambique. Declared a natural monument, this famous “pedra bolideira”, as it is called by the locals, is a 10-foot-high, 10-yard-long-and-wide stone of irregular shape, which, in spite of its several-ton-weight, can be moved with just a touch of the hand. Barreira’s rocking stones have never neglected their relationship with the natural phenomenon that first inspired them: each “bulideira” must be aligned with the mother-stone in Chaves. This strict alignment with geographic coordinates makes Carlos Barreira’s site-specific sculptures inseparable from their environments. The sculpture set in the gardens facing the São Bento Monastery follows this rule of the piece’s conceptual design. By choosing sculpture as his artistic endeavour, Barreira has never given up motion and kinetics, a key aspect in every stage of his over four-decade career. It is precisely through movement, achieved by means of basic construction solutions without engines or mechanical devices, that the author delves into the tension between the heavy mass and its apparent lightness. Barreira himself has shed light on the “lyrical, poetic” dimension of his sculptural practice, as characterised by unambiguous, rigorous construction, as well as by the numeric record of each rocking stone and the playful and interactive side of the pieces.